Imagine 33 racers at the start line aligned in eleven rows of three; the pace car leading them on the start of their 200-lap race. Are you picturing the Indianapolis 500? Think again. Held annually since 1951, the Little 500 is a 50-mile bicycle race on a ¼ mile track at Indiana University’s Bloomington campus. Whether you race cars or bicycles, you’ll appreciate Joe English, owner of Group2 Motorsports, an Alfa Romeo specialty service shop in Ballard. Although it cannot keep pace with the Ferrari 512 BB in the Group2 garage, the hand-assembled Medici Pro-Stada with Campagnolo and vintage Galli components may be English’s favorite transportation — on two wheels. These days the Medici hangs on the Group2 wall. For health concerns, Joe cycles mostly on an indoor trainer. Since doctors deterred his preferred alternative transportation, English suffers the commute from Ballard to Interbay in his 1978 Alfa Romeo Alfetta sedan or the family’s 1974 Alfa Romeo GTV, with bike racks, of course. English grew up in Seattle during the post-World War II hay days; consumer confidence, happiness and incomes were as juicy as In-N-Out burgers. His love for speed started when he was young. An engineer by training, in 1971, English managed a service station for Seattle Mental Health’s Vocational Rehabilitation Program. Gulf Oil Company presented English with an opportunity to operate a service station at 25th NE and Blakely, where he catered to foreign cars. That business evolved to Group2 Motorsports, which expanded to provide sports car repair and rally car preparation. The Group2 name comes from a class of rally cars. English relocated the business to Interbay in 2000; the new facility caters to track-day and performance cars, specializing in Alfa Romeos and BMWs. Tucked away behind a plethora of marine manufacturers, fabricators, and other industrial businesses — Group2’s Salmon Bay warehouse is six miles away from the English’s Ballard home. For years, Joe bike commuted across the Hiram M. Chittenden Locks. Walking through the grounds of the Army Corps of Engineers, Joe’s Italian-made sub-30 pound Medici juxtaposed one of the west coast’s largest civil construction projects. 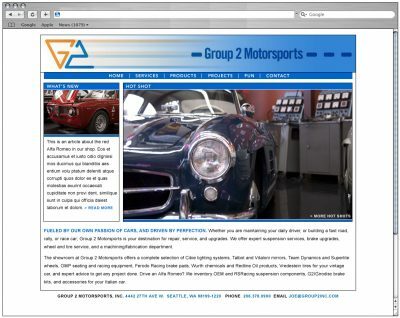 Group2 Motorsports works on vintage cars, like my father’s 1962 Mercedes Benz. If you remember ‘three in the tree,’ then you have an idea of Group2’s customers. I met Joe through his wife, Diane English; she’s the office manager for Cascade Bicycle Club. Joe and Diane spent a decade riding bikes along the California coast before returning to Seattle. When not riding her Marinoni the twelve miles from Ballard to Magnuson Park, Diane may be driving a 1969 Alfa Romeo GTV, or a 1979 Citroen 2CV, not the vehicles for most nonprofit employees. Through a common passion, drivers and cyclists can form deep social bonds. These social connections have economic value, according to social scientist Robert Putnam. Putnam traces the decline of social capital in his 2000 book Bowling Alone that researches nonprofit organizations over the past century. Recreational clubs, like the Northwest Alfa Romeo Club and Cascade Bicycle Club, are the epitome of social capital. Bridging the divide between members’ ages and political persuasions, clubs produce “bridging capital,” which Putnam determines is essential to build cohesive, civically active communities. As Cascade builds bridges between diverse cyclists, Group2 Motorsports bridges the divide between the 1950s car culture and today’s era of hybrid, bio-diesel, and eco-friendly vehicles. Take a look at the vehicles in Group2’s garage recently. Beside a 1959 Lancia Flaminia Zagato, a $500,000 Ruf, and a late-model carbon fiber Porsche Carrera GT, you’ll find an all-electric Sparrow – from a 100-strong fleet of pizza delivery vehicles. Group2’s recent customers are not only speed enthusiasts; they appreciate the craftsmanship and innovation behind their vehicles. Did Detroit’s automakers pay attention to that danger? Diane’s Alfa Romeo and Joe’s Medici bike celebrate a rich tradition of quality craftsmanship. The legacy of these vehicles may be less to the disposable, fast-food drive-through culture of suburbia then to a manufacturing culture that preserves style, grace and art appreciation. Think art meets pragmatism. The next time you shop for art, consider hanging your bike on the wall, or visit Group2’s unconventional studio. Contacted Scott with a request for assistance with my professional website and its migration to new servers. He was responsive, knowledgeable and charged a very fair price. Highly recommended.